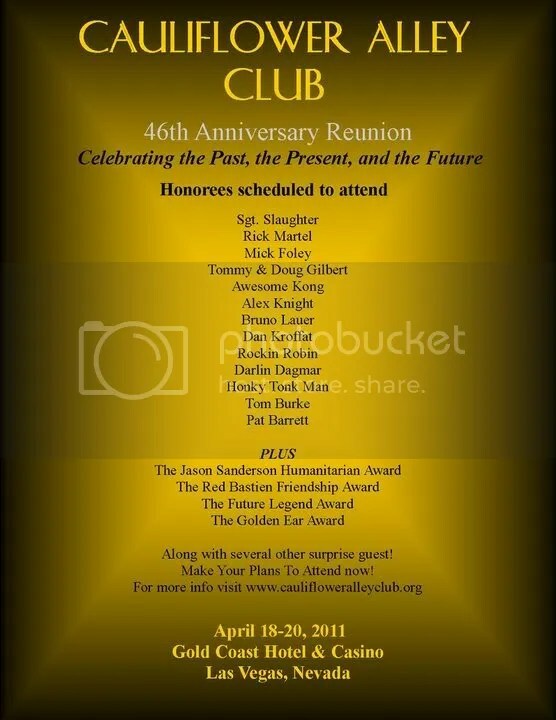 MWR is a proud sponsor for the 2011 Cauliflower Alley Club Reunion Program in Las Vegas with Honorees SGT. SLAUGHTER, MICK FOLEY, RICK MARTEL, DAN KROFFAT, THE HONKY TONK MAN, AWESOME KONG, TOMMY, DOUG and Eddie Gilbert plus many more. The 2011 CAC reunion will be at the Gold Coast Hotel the week of April 18 – 20, 2011 and we hope that you take the opportunity to make the trip for one of the must see events of the year. While you are there be sure to pick up a 2011 CAC Reunion Program. Look inside the front cover and you will see your favorite website that covers wrestling in the Midwest front and center. If you are not a member of the CAC I highly encourage you to become one in 2011 by clicking here to start the process. We would also like to thank High Voltage Wrestling for offering to help support our goal of putting an advertisement of MWR in this prestigious program. Please note that we are very proud of the ad that is below though the checklist for the MWR Trading Cards have changed a bit with card number of Mike Sydal being #37 with hopes that our good friend Dan Gier coming later in the set.